Now I know there isn't much to see in this photo, but you can just make out the metal sides to the road bridge over what used to be a line into a goods yard off the main line through Plymouth. The main line is still here but the goods yard has long gone. When I was last there it was impossible to get a good view from the other side as it was all closed off for the construction of a nice new, and probably quite bland housing estate. 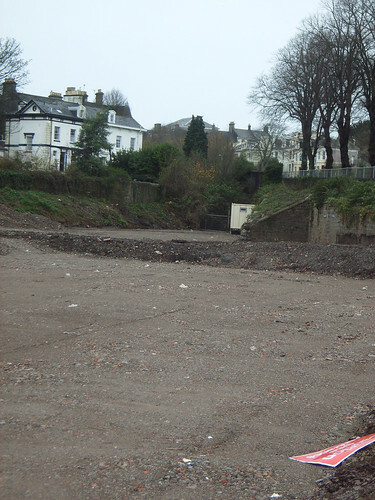 In the photo below you can see the site has been cleared and levelled ready for the building to start. The bridge itself is tucked in just behind the metal portable building in the middle right of the image. 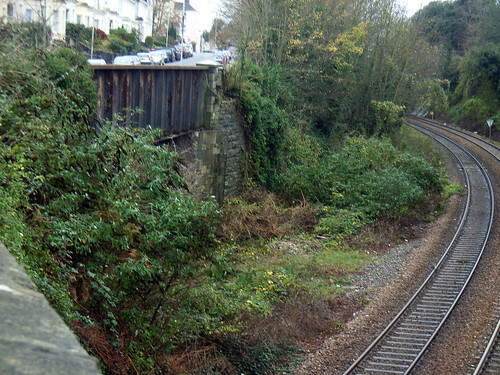 As well as being a goods yard it was also a link between the two main lines through Plymouth as the bottom of the site was linked to the line into Devonport Station. This can be seen more clearly in this modified Google Map image with the green lines showing the old line into Devonport Station and the border of the goods yard itself. The bridge is shown top left by the red arrow. You can see that the Google image was taken after my own photos as construction is well underway. For years after the closure of the goods yard this site was some sort of builders merchant (I am sure it was something like that anyway!) I am still trying to work out the dates that the goods yard was closed. I am sure I will come back to this whole area again during the summer! Visit What the Penguin Likes for a run down on watching television on the Internet. The goods depot opened in 1892 closed 14.5.57 Graham but continued in use as a an Engineers Depot until the late 1990s. As you say when that closed the site was used by a builders merchant. The site had no connection with the L&SWR line.